Over the years my skin has changed a lot, it can be dry in places and normal in others but all round I have oily skin. I have to deal with my oily skin on a daily bases and wearing makeup can be a struggle sometimes but in this post, I have put together a few base products that are perfectly suited for people with oily skin like me! Primers are actually very important when you have oily skin and your going to be wearing foundation. This is the first step in the makeup routine which should be done when wearing a foundation on top whether its a matte or dewy finish. 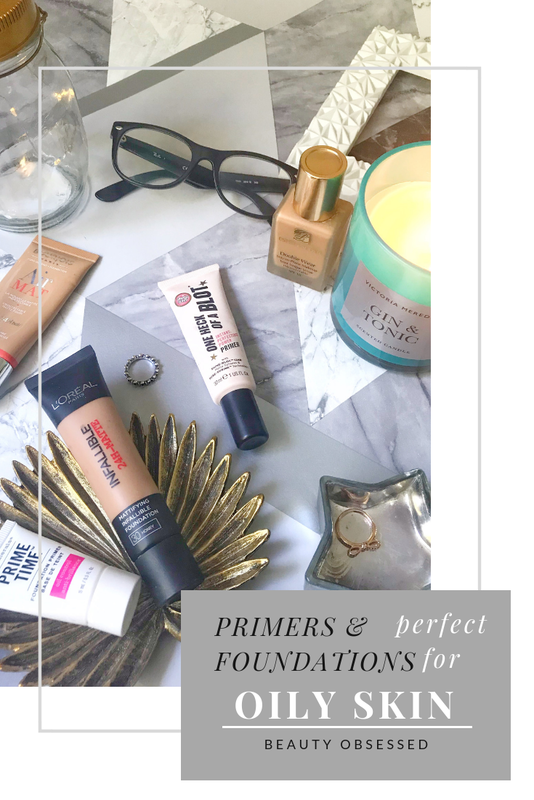 The first primer that I have added to this guide it the Collection Primed and Ready Primer, this primer has an added benefit of witch hazel which helps to keep any spots at bay. This is a silicon-based primer which helps to fill in any pores and smooth out the skin. My nose is my worst culprit, it always gets oily throughout the day, if I apply this primer before my foundation I can go hours without my skin getting oily and shiny. This primer leaves your skin feeling extra soft and smooth without drying out the skin. I usually just apply this primer on the areas that its needed like my nose, chin and forehead, this product also helps the foundation to glide on the skin easily. 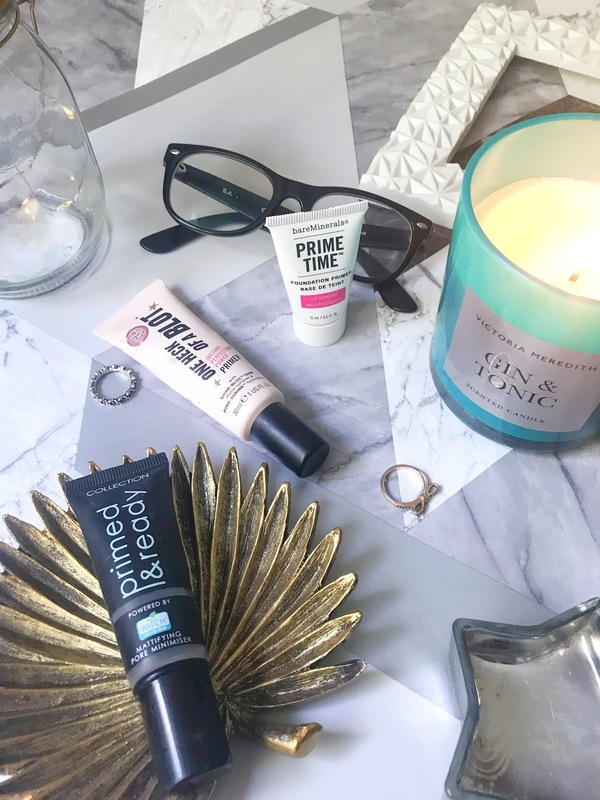 Another primer that I always tend to reach for is the bareMinerals Prime Time Oil Control primer, this is slightly different to the Collection primer because of its consistency, this primer isn't as thick as the Collection one and only a thin layer of the product is needed to help keep my skin oil free for hours. This is the primer I tend to use when I wearing a ticker foundation as once its absorbed into the skin it doesn't feel like your wearing anything. This product also makes my skin feel extra soft and more pores are filled out. This primer keeps my foundation looking flawless as well. I couldn't find this exact primer but BareMinerals have got a Blemish Ready Mattifying Primer which I think would be a perfect substitute for this oil control primer! The final primer that it suited for oily skin is the Soap & Glory One Heck Of A Blot Primer. I discovered this primer a few years ago and have been using it on and off ever since. This primer also has a different consistency to the other two, this primer has more of a moisturiser consistency with a slight silicony feel. This primer actually leaves my skin feeling hydrated but also creates a barrier for my oily skin. This product creates a really soft base for foundations and it keeps my foundations looks extra smooth all day making it one of the best drugstore primers. There are a few key foundations that I stick to keep my oily skin at bay, these foundations are also all matte which I love as it makes me stay shine free. The first foundation that I usually reach for a lot when doing my makeup is the L'Oreal Infallible 24 Hour Matte Foundation as it is just one of the best foundation's I've tried, while I haven't tried this foundation on for 24 hours it is a really long wearing product that lasts really well on my skin. With non-matte foundations, they usually wear away a lot around my nose which can be really annoying but with this foundation, if I apply a pore filling primer on beforehand it stays on so well without any separating on my skin. I find this applying this with a foundation brush the best way to blend it out into the skin which can be done in just minutes. If I'm going on a night out and I know it's going to hot when I pick this foundation as its so long lasting. For people who love an extra long wearing and matte foundation, this is the one for you, Estee Lauders Double Wear. 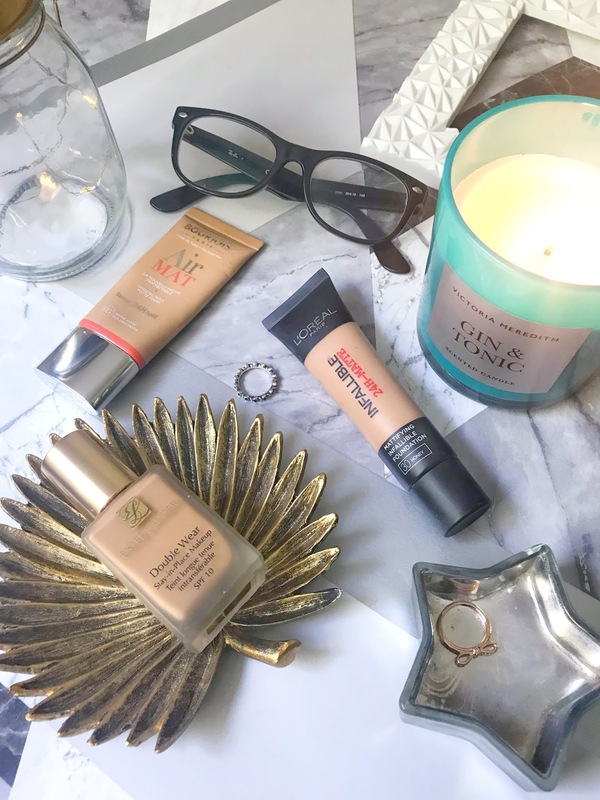 This foundation is a holy grail for so many people and I know why it is on more of the expensive side but it is really worth it. I have been using this foundation for a few months and really love how it makes my skin look. This foundations applies so easily and leaves the skin with a lovely matte finish without making you look cakey which I hate. What I love most about this foundation is that you don't need too much product to have a full coverage. This product keeps my skin looking oil free all day and doesn't wear away! 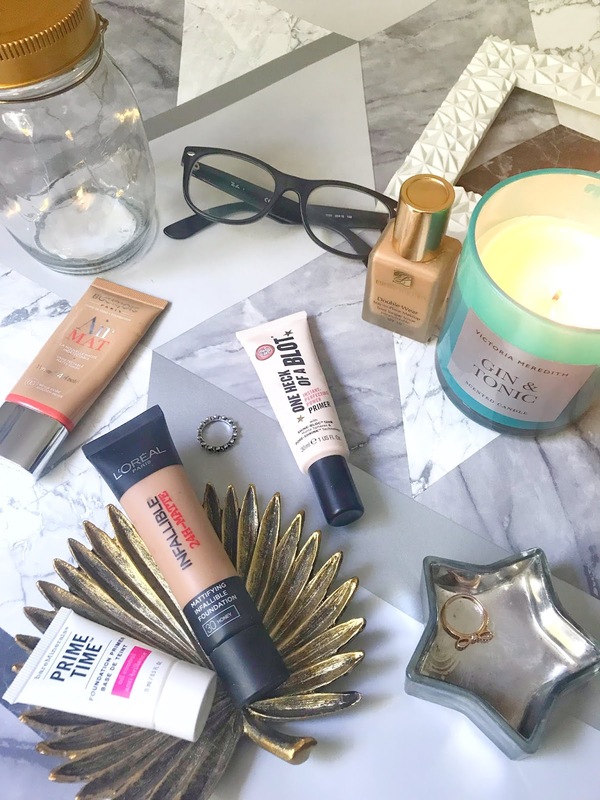 Another high-street favourite of mine is the Bourjois Air Matte, this foundation has been a favourite of mine and have mentioned it in a few older posts like my Summer Foundation Routine. This foundation is one of my favourites because of how easy it is to apply to the face and how beautifully matte my skin looks. I would say this foundation is a demi-matte which means it isn't too matte and still gives the skin a healthy glow. This product blends out so quickly with either a brush or a sponge. My skin just seems to really agree with this foundation as I barely need to powder throughout the day. Having oily skin can be hard and finding a product to work for your skin can be equally as hard. What products do you use with that best suits your skin type? Wow, so many amazing suggestions here! And lovely photos too :) I think I have combination skin - I'm definitely not completely oily but I'm not dry either! I have combination skin but I love the prep and blur from ELF! It's amazing! Loving these tips! I feel like my skin insists on being oily at the worst possible times. So I'll definitely be trying some of these. I actually bought the One Heck of a Blot primer after hearing so much about it. I really like it -- I mostly like that it doesn't have that silicone feel that so many other primers do. And, it does a great job at keeping my oily skin calm. This is such an informative post. I loved your suggestions. I've never worn primer but maybe I should start!